Lord Beaverbrook, Minister for Aircraft Production, says ‘the sky is the limit’ for plane purchases from US, with spending running at Â£2.5 million per day on aircraft. Admiral Raeder, C-in-C of the German Navy expresses his reservations about any invasion of Britain. Stalin replaces 3 major Soviet commanders appointing Voroshilov for the northern, Timoshenko for the central and Budjenny for the southern fronts. Armored units of Panzer Group 1 advance within 10 miles of Kiev. Vichy government rejects Syrian armistice terms but Dentz accepts. US establishes Office of Coordinator of Information under William Donovan to coordinate intelligence and propaganda. The attacking German forces at Kursk have been depleted by heavy losses in men and armor and have nearly spent their momentum, even though the 4th Panzer Army and Army Detachment Kempf in the southern sector have succeeded in capturing the pivotal town of Prokhorovka. To prevent further attrition, especially of the vital armored forces, Field Marshals von Kluge and von Manstein urge Hitler to call off the operation, but Hitler refuses. Allied transport planes fired on by US Navy ships in the Sicily invasion-reform of Army Air Force and Navy coordination results. The US VIII Corps continues its attacks from the Carentan area toward St. Lo, but is meeting with strong German resistance. 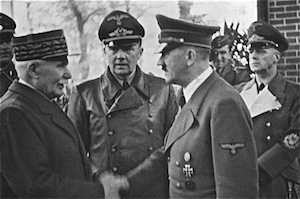 The United States formally recognizes the provisional French government of General de Gaulle in London as the de facto government of France. The Red Army captures the remnants (35,000) of the encircled 4th Army. At Waw, Burma, British repel attack by remnant of Japanese army.